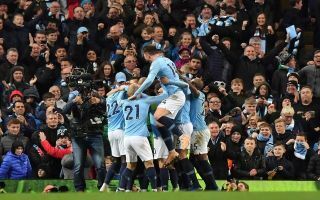 BBC Sport pundit Garth Crooks is back with his Premier League team of the week, and Man City are well represented after their derby win over Man Utd. To his credit, Crooks has looked right around the league this weekend as opposed to going with players from the top teams, as seen in the XI below. Jordan Pickford kicks things off between the posts after his starring role in Everton’s goalless draw with Chelsea, with his shot-stopping and distribution earning praise from Crooks which is enough to earn himself a place in the line-up. Matthew Lowton, Sol Bamba, Juan Foyth and Andy Robertson make up the backline, with all four having a crucial impact in the results for their respective sides. Crooks has a habit of including players who score, and he’s done so again here with Bamba and Foyth on the mark for Cardiff City and Tottenham respectively, while Lowton made a crucial goal-line clearance in his side’s draw with Leicester City as Robertson was key defensively and as an attacking threat for Liverpool against Fulham. In turn, it’s a balanced back-four, with the quartet all proving to be decisive in their own way. Moving into the midfield and this is where Man City begin to take charge with stalwart Fernandinho and David Silva lining up alongside Felipe Anderson. From the Brazilian’s work ethic, defensive coverage and experience to Silva’s sublime quality on the ball in addition to his goal, it’s difficult to disagree with either being included given their influence in the win over Man Utd, while Anderson was on the mark for West Ham United. Goals are the order of the day up front for Crooks, with Mohamed Salah, Raheem Sterling and Salomon Rondon completing his XI. Salah bagged one for the Reds while Rondon was at the double for Newcastle United as Sterling put in a quality performance for City to emerge as a real attacking nuisance for United throughout. With that in mind, it’s difficult to disagree with the selections from Crooks this week, as all the 11 players named below have certainly made their case for inclusion. Nevertheless, it does come down to opinion and the pundit will have missed out some individuals that others believe deserved to be included. In turn, he may well still face his usual scrutiny which seems like a weekly occurrence even when he does seemingly get it right.